Leefe, John G.. "Piracy". The Canadian Encyclopedia, 04 March 2015, Historica Canada. 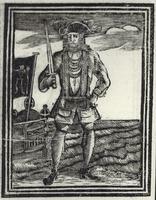 https://www.thecanadianencyclopedia.ca/en/article/piracy. Accessed 23 April 2019. Halifax has been the site of 2 piracy trials. In 1809 Edward and Margaret Jordan and a sailor named Kelly were tried for seizing the Three Sisters, previously owned by Jordan, and for murdering a number of the crew. Piracy, seizure and robbery of craft at sea or in the air, has played only a slight role in Canada's history. In 1612 Peter EASTON, an English pirate, embarked on a series of raids on English, French and Portuguese fishing fleets in Newfoundland harbours from Trinity Bay to Ferryland; he inflicted little injury but caused an estimated £20 400 damage. Much of Canada's piracy centers on tales of buried booty. A fabulous treasure ascribed to William Kidd (hanged in 1701) is reputed to be buried on OAK ISLAND, off Nova Scotia's south shore. More certain is the June 1720 attack on Trepassey, Newfoundland, by Bartholomew ROBERTS, the most successful corsair of piracy's Golden Age. Roberts captured 22 merchant ships and 4 vessels, and sank a few fishing boats. Proceeding to the Grand Banks, he captured 6 French vessels. Roberts, who during his 4-year career captured 400 ships, was apprehended in 1722 by ships of the Royal Navy off West Africa. Halifax has been the site of 2 piracy trials. In 1809 Edward and Margaret Jordan and a sailor named Kelly were tried for seizing the Three Sisters, previously owned by Jordan, and for murdering a number of the crew. The vessel's master, John Stairs, threw himself overboard on a hatch cover upon which he floated 4 hours before being picked up by an American fisherman. Margaret and Kelly were acquitted, but Edward Jordan was found guilty of murder and piracy and was hanged on 23 November 1809. His tarred and chained corpse was gibbeted at the entrance to Halifax Harbour. In 1843 Capt George Fielding and his son sought passage home to England from Peru. Sailing from Valparaiso on the barque Saladin, Fielding successfully persuaded some crew members to seize the vessel and murder 6 shipmates. Under Fielding's command the Saladin, with a valuable cargo of guano, copper and silver, a chest of dollars and several money letters, set course for Newfoundland. So terrified of Fielding were his fellow conspirators that they threw him and his son into the sea. The Saladin went aground near Country Harbour, Nova Scotia. The crew members were charged with piracy, a charge that was later changed to murder. Two were acquitted because they had not taken part in the murders and were deemed by the court to have been unwilling partners in the death of the Fieldings. The other 4 were hanged 30 July 1844 on a knoll where Victoria General Hospital now stands. In more recent years Canada has experienced a limited number of incidents of hijacking or sky piracy. On 29 November 1974 Naim Djemal hijacked an aircraft over Saskatchewan, assaulted a stewardess and ordered the pilot to fly to Cyprus. Upon landing for fuel in Saskatoon, Djemal handed a knife to the captain, and then walked off the aircraft and was subsequently arrested, tried and found guilty.